Does anyone have Crashdown! in better quality than 360p? You should be able to turn off the wifi part of the router and plug in your own. So yes, if the crummy shitbox your ISP gave you is bad, get something better. Wait, so I couldn't just plug in a new router and ignore the wifi the modem sends out? I unfortunately can't replace the modem the ISP provided. I assume I would need to disable the modem's wifi as well (questions herpderp I am not savvy). Like right now, there's no router as it stands. Yes there is; your modem is one of the router+modem combos that are really popular now. Either you turn off the router portion of your modem (ask your ISP how) and plug in your own, or do what you said and ignore the wifi that your router+modem gives out. Oh, okay, sounds cool. The replies were helpful. Those are so called welcome messages. (sent as notices) I guess you could add Q to your ignore list. @Furai Thx! I Ignored Q and edited the ignore in Adress Book (ALT+B) to only ignore notices. @Fawkzy @Bistoufly I'm curious about other IRC clients that perhaps would have a cleaner GUI, so I will try the ones you mention But I have all the functionality I need in Mirc. @Fawkzy @Bistoufly I'm curious about other IRC clients that perhaps would have a cleaner GUI, so I will try the ones you mention But I have all the funktionality I need in Mirc. I'll second hexchat (a continuation of x-chat). Very clean and simple, but still very functional. 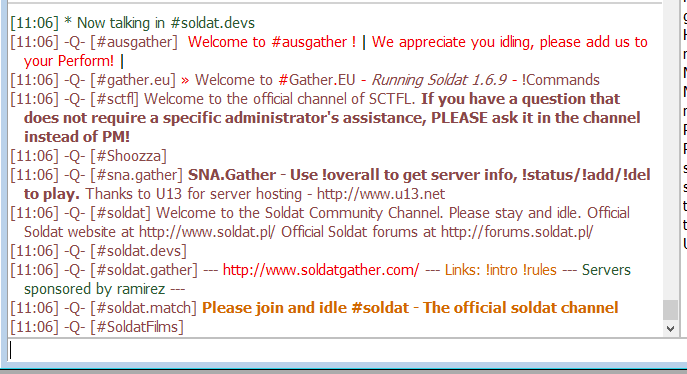 Which pixel art scaling algorithm is soldat using?